Home › Corporate Fascism › What caused America to collapse? Rome warned us. We didn’t listen. What caused America to collapse? Rome warned us. We didn’t listen. In a previous post I discussed Diocles, who contributed to the downfall of Rome, not in a day or a week or a year…not even in a single lifetime. The downfall of a nation is an all-consuming fire that burns cold. It is all around us, but we don’t feel the heat, so we, “keep calm and carry on,” while the expansive arching buttresses of constitutional protections that uphold our freedom and independence collapse all around us in red hot explosions of liquid ember. Venti hazelnut mocha, hot please. Thank you. Hanging out in Rome, surrounded by ruins of all ages, you can’t help but have big thoughts about the state of the world. Here are a few of mine. No generation during the long fall of the Roman Empire was really aware of it. Each generation accepted the conditions they inherited and worked to survive as best they could. And so it went for hundreds of years. The “fall of Rome” was obvious only to historians. It never really felt like falling. Europeans and Americans should know something about that. There have been no appreciable gains in real median household income in the U.S. since the mid-1970s. We work harder and longer for less. Two-income families are a necessity. Young people are full of angst about the future. As for Italy as a nation, the third millennium has been a disaster of unrelenting decline. Then and now, the same stuff dragged us down: massive public debt, bureaucracy, unsound money, imperial ambition, official corruption, parasitism, capital depletion, and, above all else, the exaltation of the rulers who loot and destroy over the ruled, who actually build and sustain civilization. I’ve been in Rome for a week attending an academic seminar, strolling the streets, meeting old friends, touring behind the scenes at the Vatican, and otherwise feeling the buzz amid the ruins and continuing struggle. Close up, you get a different picture. The official economy is failing, but the unofficial one is busier than ever. It’s so easy to forget that the economic life of our times is not found in the headlines, the big trends reported by international agencies, or the political trends of who is up and down. With wingtips on cobblestones, you see a part of economic life that these data do not reveal. Walk the streets in all directions of the Piazza Navona and what you find is a land of thrilling commercial activity. Money is exchanging hands in the manner of the ancient world, but the products are new. There are loads of so-called “pirate” goods — name-brand fakes that both buyer and seller understand are not the real thing. Forget credit cards. No one takes them. It’s a cash-only world. Actually, it’s not that different in the hundreds of bars and restaurants around the bustling parts of Rome. People don’t want plastic. Some take it, but dread it. Why? It all comes down to tax collection, regulation, and the massive apparatus of command-and-control that is modern politics. No one wants any part of it. If you can get away, you would be a fool not to. And there aren’t too many fools in Rome. The value-added tax is an angry bear, and an enterprise killer. It is enforced in the most wicked way. The tax police ride around in vans and pull up to the restaurants. They demand all records and check out whether the taxes are being enforced. I suppose it’s the Italian context here, but it seems more like a mob shakedown than public policy, and who can really tell the difference? The whole scene is a reminder of how little we actually know for sure about the structure of the world economy. Some estimates suggest that one-half to two-thirds of the workers of the world owe their jobs and livelihoods to the existence of the “informal sector.” That means, essentially, living and trading outside the officially approved ways. 1) What does the government do around here? The answer is always the same. It takes people’s money in whatever ways it can. 2) What does the government do with the money? The answer is always the same. The money supports the politicians and bureaucracies. And that’s how the whole political system works. Money in, money out. Why not just scrap the whole thing? Sure, but no one really knows how to do that. As with every other democracy, the people slog to the polls at the appointed time and vote for some kind of dramatic change, every single time without exception. It never happens. 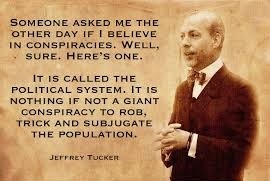 A few years later, the same thing happens again, except that this time the state is bigger and more corrupt than ever. So on it goes. As one Roman told me, the only real solution to the parasitic state is unthinkable. What that means in practice can be found variously in Shakespearean tragedies, and speaking about such things is rather dangerous. Besides, people are too busy trying to survive to bother with futile undertakings like revolution. Rome is surely one of the busiest commercial places on Earth. Marketing is a way of life. Buying and selling are the essence of all activity. People here are the world masters of extracting money from tourists, especially naive Americans who know nothing of the streetwise ways of the old-world merchant class. Given all this busy-as-bees commerce, where is the burgeoning prosperity? By historical standards, people are doing well. By standards of the U.S., Canada, and Asia, not so much. Why can’t Italy and the whole of Europe put a stop to the decline and re-enter a growth path? Why does all this commercial activity not translate to real economic growth? Rising prosperity is simply not possible without that much-maligned but still-essential institution called private capital. Private capital allows long-term investment and complex divisions of labor and specialization and creates the infrastructure for long-term economic thriving. But all over Europe, the capital stock is seriously depleted. It’s been killed by the VAT, by intrusive politicians, but most of all but the desperate desire on the part of the ruling elite to steal anything and everything in sight. People traditionally blame invaders for the fall of Rome. Nonsense. The invaders are not the problem. The real problem are the nationals who know the system well enough to manage it for their own benefit and at the expense of everyone else. ‹ Happy Fourth of July! America is Dying.